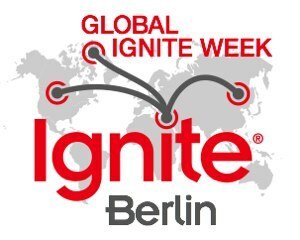 Ignite Berlin, a night of quickfire talks, will be held on March 1st 2010, during Global Ignite Week. Each presenter is on stage for a total of 5 minutes (20 slides, at 15 seconds each slide). The venue is Festaal Kreuzberg (near U-bahn Kottbusser Tor). Entry is free. Doors will open at 7pm with talks starting from 8pm. We are now requesting proposals for talks. The proposal deadline is 6pm, Sunday February 21st. Thanks for the great proposals! The schedule will be up soon. If there’s a topic you are passionate about and you want to tell the world, this is the place to do it. We’re after a mix of funny and serious, social and personal, high and low tech, crafty, webby, environmental, quirky and mainstream. Making us laugh is a good thing, making us think is even better! The only thing we insist on is No Sales Pitches. Want to know more about what an Ignite talk is and how you do it, before you submit? Follow @igniteberlin on Twitter for updates, and check back here soon for more news. Please help us planning for enough chairs by signing up to our Facebook event.